We all remember that kid who wanted to light everything on fire. Well, Valentin Guérin is one of those kids. French creative Valentin Guérin observed that “the public dislikes trombone concerts”, and as such took it upon himself to make them more interesting. Hence he decided trombones should shoot flames. 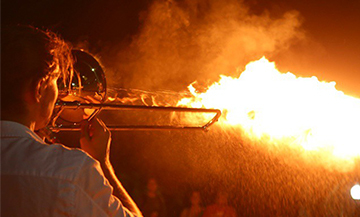 30-year-old trombonist Valentin Guérin has invented the pyro-trombone. Yep, that’s a trombone that shoots flames. Guérin invented the pyro-trombone himself and owns the patent, but there’s still room for a pyro-flute if anyone feels the urge to make one. One thing’s for sure, Guérin certainly made the trombone a lot hotter. There’s nothing like a good horn section, and with brass making a comeback, we can only hope other bands adopt flaming instruments. See the pyro-trombone in action as Guérin plays Arthur Pryor’s Fantastic Polka. Oh, and if you want to see it shoot fireworks, click here.